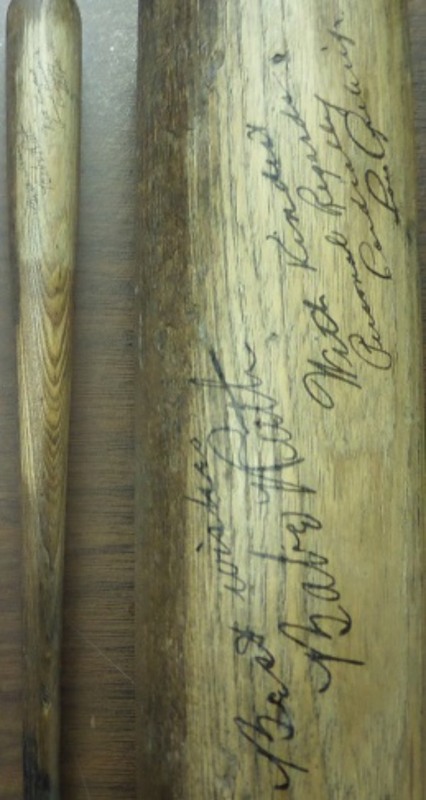 Coach's Corner - Babe Ruth & Lou Gehrig Yankees group signed BB bat. Go Back to Lot List Babe Ruth & Lou Gehrig Yankees group signed BB bat. This vintage wooden bat shows great usage and comes barrel signed by BOTH Babe and Lou in ink. The signatures grade near 7's, both have a short message written as well, and value is mid to upper thousands on the must have Bronx Bombers display bat. Sure to please, sold here with NO reserve, and possibly even used by one of the HOF Greats while barnstorming.